Chosen by Kashif, floor staff. “Sometimes a movie can throw you simply by turning out nothing like what you were expecting. 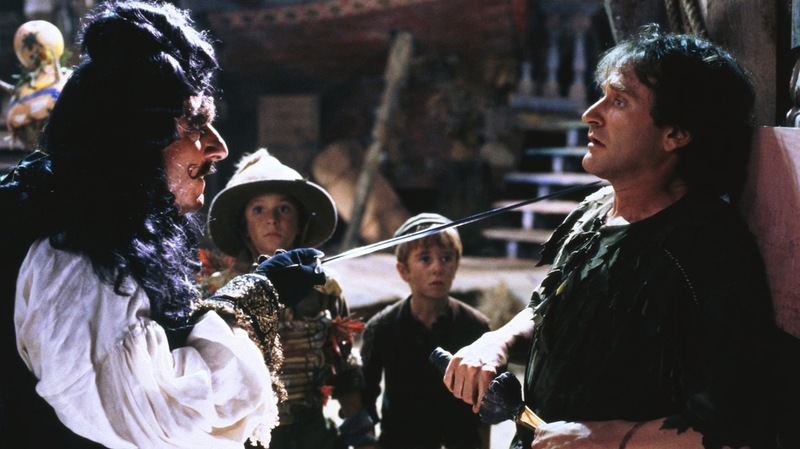 Take Steven Spielberg’s much-maligned 1991 film, HOOK. If you watched it expecting an Indiana Jones-ed version of Peter Pan, chances are it didn’t work for you. Taken on its own terms, however, HOOK now looks like the end point of the first phase of Spielberg’s stellar career. “Occasionally it’s the less appreciated films that reveal the most about a director’s body of work. At the time of HOOK’s original release it was subject to largely dismissive reviews, yet one critic saw something that most others did not. In his two-part essay for Film Comment entitled ‘The Panning of Steven Spielberg’, Henry Sheehan made the case for the film as one of Spielberg’s most significant achievements up to that point. In the mid 1980s, Spielberg considered directing a live-action musical version of Peter Pan, even getting John Williams to sketch out several musical numbers. Although that initial vision didn’t materialise, the musical DNA still found its way into HOOK. If you’ve never seen HOOK before, it’s worth approaching it as a musical only with less singing and fewer dance numbers. “Key to HOOK’s musical and theatrical vibe are the contributions of production designer John Napier, who served as visual consultant on the film. Napier specialised in theatre and worked on the Coppola/Lucas/Jackson short film, Captain EO, from 1986. HOOK was rendered almost entirely on soundstages. This was in part due to the fact that Sony had just acquired Columbia Pictures and were understandably keen to show the industry the large scale resources they could now muster. The artifice foregrounded by the film is essential – the story being about a man’s journey away from reality. Once we arrive in Neverland, the shallower focus images contrast neatly with the deeper focus of the non-fantasy scenes. “At the film’s midpoint, amid all the frantic Lost Boys shenanigans, sits one of the most elegantly rendered sequences that Spielberg has ever directed: the scene where adult Peter remembers his past. The screenplay by Jim V Hart expertly channels the thematic core of Peter Pan, but not its entire plot. The sequence in question is a great example of this, drawing from the chapter ‘The Home Under the Ground’ in which Wendy Darling’s memory of home is referred to. “The narrator observes that, “she was absolutely confident that [her parents] would always keep the window open for her to fly back by…” This detail becomes a key line of dialogue in HOOK and it also gets due treatment in the above sequence. Hart and Spielberg do further justice to the novel’s open window image, which works especially well when the focus shifts to Tinkerbell and not Peter; in close-up we see her looking forlornly through a closed window, Peter and Wendy together reflected across Tink’s face. Part of Weekend Classics: Staff Picks.